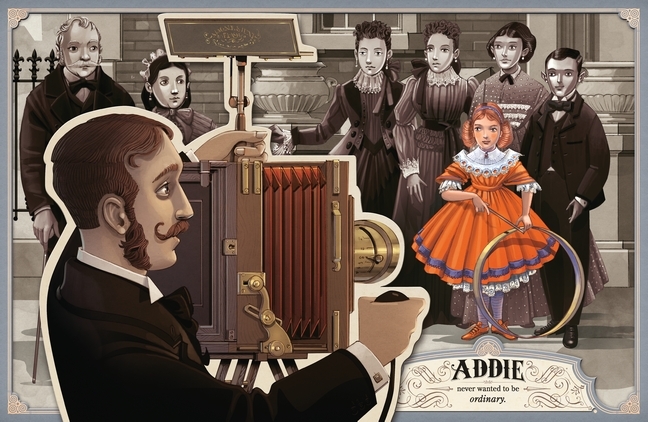 Anything But Ordinary Addie: The True Story of Adelaide Herrmann Queen of Magic written by Mara Rockliff and illustrated by Iacopo Bruno reminds me of why the format of non-fiction picture books are so important. Not only can a non-fiction picture book take a bite-sized nugget of fact, be it historical, scientific or biographical, and make it engaging and engrossing for young readers, but the addition of illustrations, especially when they are as detailed and rich as Bruno's, the subject comes to life and takes on an added layer of understanding and interest. This is especially true for the life of Adelaide Herrmann, pioneering first female magician, born in 1853. 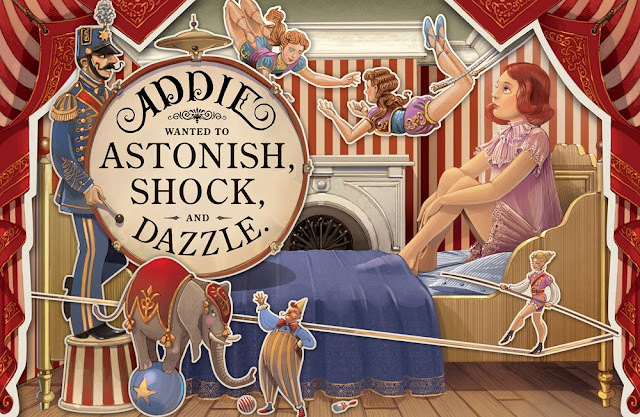 The text, including the wonderful author's notes, helps readers to understand the accomplishments Addie made in her lifetime while superb illustrations show readers what life (and challenges) during a specific time period looked and felt like. 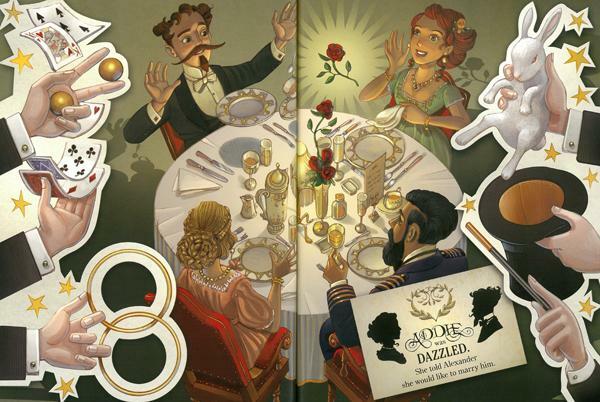 Anything But Ordinary Addie: The True Story of Adelaide Herrmann Queen of Magic is a perfect example of this perfect pairing of words and pictures, brought to the page by the dynamic duo of Rockliff and Bruno. As always, the author's notes provide an added layer of interest with facts beyond the body of the text itself. Born in Victorian Era London to Belgian parents, Adele Scarsez did not want to be ordinary. As a child, she saw an advertisement in the newspaper and sewed her own dancing dress and auditioned for a ballet troupe. Shocking as it was to see their daughter on stage and in tights, her family had to admit that Addie was an astonishingly good dancer. Craving more extraordinary experiences, Addie hopped on the "newfangled invention called - The Boneshaker!!!" (a.k.a. the bicycle). She traveled all over Europe doing tricks and dazzling audiences until she decided to head out to the next frontier, America. On the crossing, Addie met and proposed marriage to Alexander Herrmann, part of a family of famous French magicians. Upon disembarking in New York City, the two were married by the Mayor, with Alexander magically pulling a roll of bills from his beard for payment afterwards. Addie became Alexander's assistant and partner and the expanded their show, adding jugglers, ventriloquists and the beautiful Geraldine who shot herself out of a cannon. When Geraldine left without giving word before a show, Addie took her place, even though she had never performed the feat before. One of Alexander's most renowned feats was the Bullet-Catching Trick, which caused Addie no end of anxiety. When Alexander died in his sleep in 1896, Addie was heartbroken but knew that the show must go on. She took over, becoming the Queen of Magic, performing all of Alexander's tricks. Knowing that there was only one way to get bodies in the seats, Addie even performed the Bullet-Catching Trick herself! As often happens, the author's notes of any good non-fiction picture book provide details that are almost, or occasionally sometimes, more interesting than the narrative itself. I was fascinated to learn that Addie went on performing on her own for another thirty years after Alexander's death until her own in 1932, when, shockingly, her accomplishments vanished into obscurity, forgotten by the world of magic. Hard to believe, but it was (is) a man's world. The story of how Addie and her accomplishments were rescued from obscurity, as well as her long-lost memoir, Sixty-Five Years of Magic. The who and the how of this miraculous rescue are also part of the back matter that you will have to read for yourself! Another amazing thing you can read for yourself, over at Mara Rockliff's website, are the secrets of the Bullet-Catching Trick! 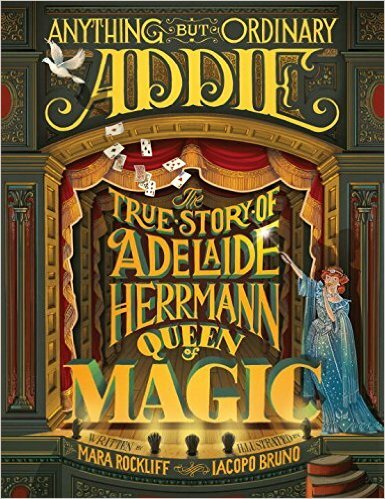 After reading Anything But Ordinary Addie: The True Story of Adelaide Herrmann Queen of Magic be sure to learn more about Adelaide Herrmann and Margaret Steele, the magician who rescued her from obscurity.